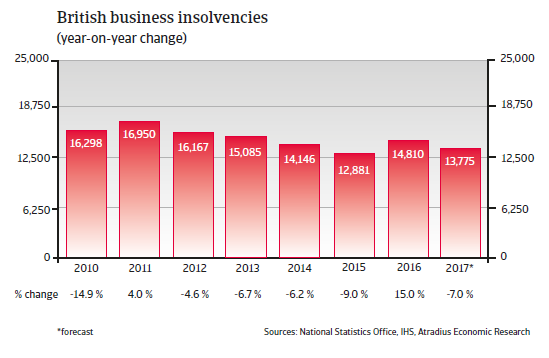 In 2016 the UK Insolvency Service recorded a 15% year-on-year increase in compulsory liquidations and creditors’ voluntary liquidations in England and Wales rose to 14,810 cases. However, this increase was primarily caused by changes to claimable expenses rules, which led to the liquidation of nearly 1,800 personal service companies (PSC) in Q4 of 2016. 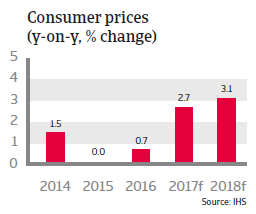 Excluding those PSCs, the increase was 1% year-on-year. 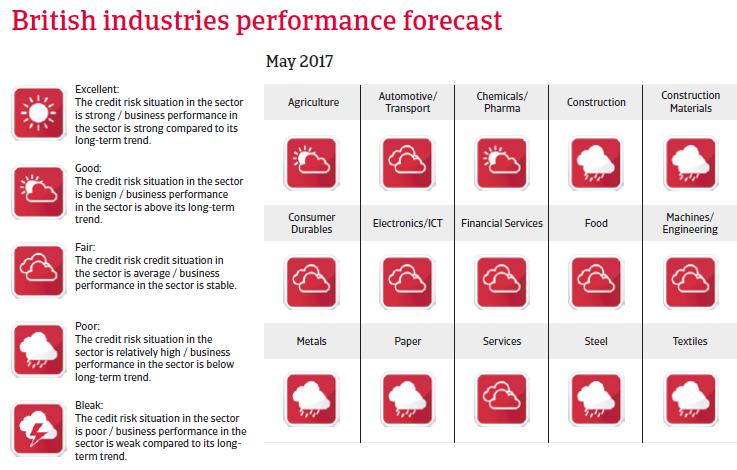 Given the exceptionally high insolvency level in 2016, an 7% decrease is expected in 2017, signalling statistical adjustment, but not economic resilience, as business insolvencies in certain industries are expected to increase due to on-going uncertainty surrounding Brexit. In the aftermath of the June 2016 Brexit vote the UK economy remained resilient, recording 2% growth last year. Consumer spending has been the engine of economic expansion, supported by relatively high employment. The momentum has remained strong thus far in 2017, but higher inflation due to the weak pound and increasing uncertainty surrounding negotiations with the EU will likely weigh on household consumption in 2017. Investment growth will slow down due to increased uncertainty over the course of the EU-UK negotiations (the UK government invoked Article 50 in March 2017, formally beginning the exit negotiation process with the EU). 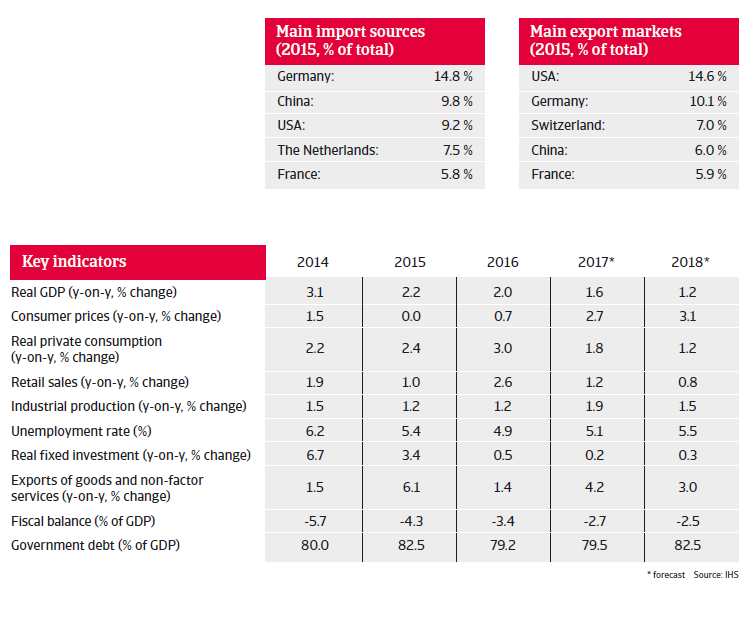 At the same time, exports are expected to pick up in 2017, helped by increased international competitiveness due to the weaker pound. 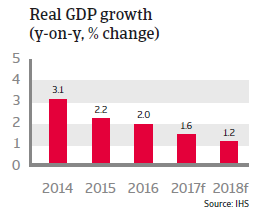 UK GDP growth is expected to slow down to 1.6% in 2017 and 1.2% in 2018. Despite increasing inflation, the Bank of England has kept interest rates at 0.25% for the time being.